ANNUAL TRACK TREK: at the Bluebell Railway is this Saturday (November 18) and already more than 200 walkers have registered to take part. However, there is still time and available spaces for you to register to take part by simply going to tinyurl.com/track-trek. If you are undecided and simply want to turn up on the day with your completed sponsorship form and money, then a limited number of walkers can be accommodated on a first come, first served basis. 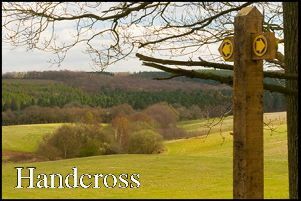 However, if you require the use of the complimentary bus, either to get to East Grinstead from Sheffield Park in the morning or back to East Grinstead in the evening, then registering for the Trek guarantees a place on one of the buses. Taking part in the Track Trek provides a unique opportunity to be able to walk the entire line with no trains running and see the line from a completely different perspective, including walking over Imberhorne Viaduct and through Sharpthorne Tunnel, the longest tunnel on a preserved railway. This year’s event is supporting the Tr(ack) Action Appeal which aims to raise £250,000 to accelerate the track renewal programme that requires large sections of the Railway’s track to be replaced. It is hoped to raise, from the Track Trek, enough money to purchase a complete 60-foot length of brand new track. CHRISTMAS MARKET is being held at St. Peter’s Church on Saturday November 25 from 10am until 2pm. Stalls to include Deer View Fine Foods, Bluebell Vineyard, handmade Christmas gifts, cards and art, toys, cakes and many more stalls. Do go along and meet Father Christmas too. Entrance costs £2 per person, which includes refreshments. VACANCY PARISH COUNCIL: One vacancy has arisen on Chailey Parish Council which the Council proposes to fill by co-option. Any eligible person who wishes to be considered as a candidate to fill the vacancy should submit a brief curriculum vitae and a written statement explaining why he/she wishes to join the Council and the skills and experience that he/she would contribute to the work of the Council. This information must be sent to the Clerk to the Council (Stephen Treharne) at the Parish Office, The Reading Room, Chailey Green, Chailey BN8 4DA by Thursday November 30. For more information contact the Clerk at chaileypc@btconnect.com or on 01825 722388. SENIOR CITIZENS CHRISTMAS PARTY: is being held by the Bonfire Society on Saturday December 2 from 12.30pm to 5pm at the village hall. Entertainment and transport is provided. If you would like to book a place or would like more information please contact Jane Stent on 01273 400632 or jane.stent@btinternet.com. WHIST DRIVE: organised by Chailey Women’s Institute, is at the village hall on Saturday December 2 at 7.30pm. Admission costs £3.50 and everyone is welcome, there will be prizes, a raffle and refreshments. For more details call Carol Brown on 01825 723757. CHAILEY WI: meet on Tuesday December 5, at the village hall, at 7.45pm and the speaker will be Ian Gledhill on the subject ‘The Magic of Panto’. There was a change to the speaker in November and the group were entertained by Jim Whelan, an excellent speaker, who has been in show business for 50 years starting as a comic singer in theatres and clubs and progressing to TV including Coronation Street, Emmerdale and more recently Home Fires. His regular appearances on Coronation Street came when the plot demanded a vicar and he was called upon To enjoy such talks and other WI activities do go along to any of the meetings as prospective members and guests are always very welcome for a nominal charge of £3 which includes homemade refreshments. For more information call Margaret Smith on 01825 723519. CHRISTMAS TREE FESTIVAL: at St Peter’s Church is the weekend of December 9 and 10, on Saturday from 10am to 5pm and Sunday midday to 5pm. There will also be music and refreshments. LUNCH CLUB: at St Peter’s Church is held monthly at 12.30pm in the church, on Chailey Green, and the next lunch club is on Thursday December 14. All are welcome to go along for a delicious meal, meet new people and chat and relax. The food is freshly prepared and home-cooked with a main course, choice of puddings and tea/coffee all for £5 per person. There is easy access and disabled toilet facilities. If you require transport or further information please contact Julia Guerard on 01825 722967. CHAILEY CLASSIC: and Vintage Tractor Club Following their inaugural charity Tractor Run in September the Club have a tractor run to The Fountain at Plumpton, in support of the primary school, on Sunday December 17. Also for those interested in meeting members and finding out more about the Club (you don’t have to have a tractor to be a member) there will be Christmas drinks and a buffet at the Five Bells on Thursday December 21. For more details now contact chaileytractorclub@gmail.com or the Club’s Chairman, Howard Venters, on 01684 565533.